Best Standard Rooms at Any Show! Our Stereo Showrooms are Unique! The showrooms are also your sleeping rooms. The living room measures 12.25’ x 19.5’. There are no large built-in units to try to work around. The sofa can be easily moved to the position you desire for your demonstration. The table can be moved into your bedroom. Extra chairs are available as you desire. King or double queen beds available – Limited availability, reserve early! The location we have selected is a special Embassy Suites that was originally constructed as a condominium. 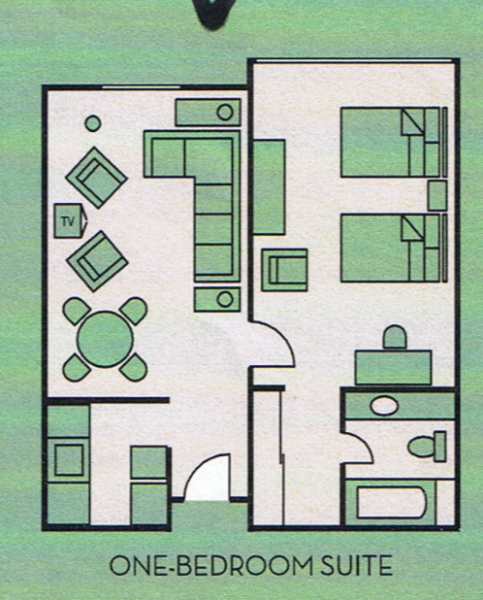 This means it is a real suite with bedroom, bath, kitchenette and a living area. The walls are thicker and provide better sound insulation than the typical hotel room. The living area measures approximately 12.5’ x 19’ with furniture which can be moved to accommodate your display. A fairly large flat screen TV mounted on a side wall cannot be moved, but could be incorporated into your display if you wish. Stepping into the suite, you pass the kitchenette to one side (which could be used for static displays or storage) and then enter the spacious living room. The small dining table can be used or moved to either the kitchen area or the bedroom. The sofa can be positioned along either wall to suit your needs. Additional chairs can be requested at no additional charge. Then, to the side is the private sleeping room and bath. This means you have probably the best standard display room of any show and a sleeping room for one very reasonable price. Registration is just $3,200.